I heard Jonathan Zittrain speak at a CIO Magazine event about 9 months ago in Boston and had his book "The Future of the Internet" in a big pile up until about a month ago. 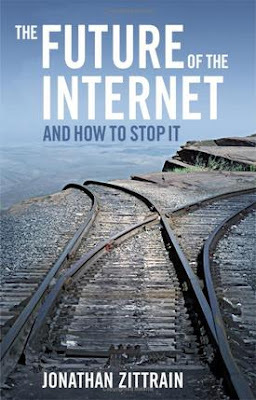 The subtitle "and how to stop it" put me off a bit and in my usual way, I judged the book by it's cover, thinking that this was yet another explanation about how the Internet is about to collapse, sending us back to the dark ages. The thrust of the book however is all about "generativity" - the ability of certain technologies which allow users to create new and unexpected things from humble, typically underground or misunderstood beginnings (think... the Internet itself!). The PC as a generative platform however is probably the biggest and most effective example, it being at the very core of some of the concepts Zittrain tackles. The book uses some terrific (and recent) examples but ultimately leans on Wikipedia a bit too much. Have you noticed that many, many recent books lean on Wikipedia's singular example? Ultimately, the book deals with generative technologies vs. appliances. After outlining some terrific arguments about security (or lack thereof) and discussing privacy 1.0 and 2.0 towards the end of the book, I believe that Zittrains's book is an effective warning against locking things down too tightly. At the end of the day, as we all begin to rely on managed devices like iPhones, Tivos and Xboxes and managed services like Hotmail, Gmail and Flickr, the issue become two fold. First, these appliances and services have zero generativity. You can only customize them just as much as the manufacturer or provider allows thus limiting what we all can create that is new and unexpected. Secondly, while appliances theoretically would/could be more secure, there are no guarantees, and what we give up with these appliances and services ultimately put us in a major position of weakness from both a data ownership and privacy standpoint. For years I've railed against iPods because of this very concept. I HATE the fact that they control what formats they will allow played on the device and HATE even more that you can only purchase and manage music via iTunes on their terms. As we've seen recently when Yahoo and Wal-mart shuttered their music services, very bad things happen when the providers decide to close the service or change the rules of the game. As for how this relates to my role at Microsoft it's perfectly aligned. The CIOs in our online community must certainly be thinking a lot about these issues, even if they haven't read this book. Controlling things from end to end is many an IT managers dream, yet what happens when generativity is turned off inside an organization and all you are left with is locked down appliances? I'm guessing that things end up more secure, though a bit less innovative. For a terrific review by Cory Doctorow visit Boing Boing. Cory also points out that the book is downloadable via CC license. I have similar concerns about controlled environments that suppress creativity. The current push towards "virtual desktops" that provide a controlled desktop managed from a centralized server farm will crush creativity in the user community. Developing 21st century versions of the 3270 terminal will ill serve us all. We need to put open tools in the hands of many people and see what ideas result. That said, I've never had a problem with my iPod. I only use DRM-free music (ripped from CDs or purchased from Amazon). iTunes is just a sync tool that gets it onto my iPod.